In an average year, Elysium would be getting a great deal of attention as an intelligent, savvy summer action film. It's R-rated science fiction for adults, with themes that reach beyond its surface trappings and clever-enough mechanics. In 2013, however, where so much has been so strong already, it seems that perhaps Elysium's deserved hype is taking a bit of a critical hit, possibly as a result of a certain ennui. It gets tough to write positive review after positive review, and when most years are a more thoroughly mixed bag, it seems only normal to expect an existential crisis: is this movie actually good or are my standards just dropping? This, it seems to me, is maybe the only logical reason I've come up with for Elysium's relatively disappointing opening this weekend. After much buzz, the film has opened to a comparatively slight amount of fanfare, and even a few ill-placed mentions of After Earth. That's just not right. 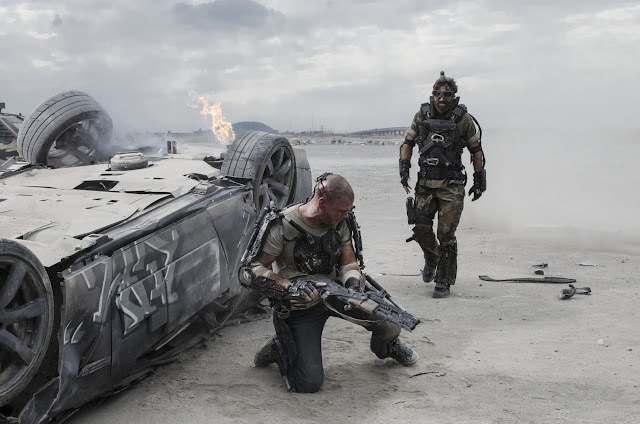 While Elysium tends towards the heavy-handed in its action sequences and in its big picture themes, it's the sort of science fiction that can, and should, be generally described as a good movie. Any similarity to After Earth rests solely in the work director Neill Blomkamp is attempting with language, and yes, these moments are admittedly distracting, as we'll see. The year is 2154, and Earth as we know it has been transformed into one overcrowded, resourceless, wasteland of a slum. The wealthy and powerful have vacated the planet to live on the star-like Elysium, a luxury space habitat of green lawns, white mansions, and semi-magical med-bays to heal your every illness. 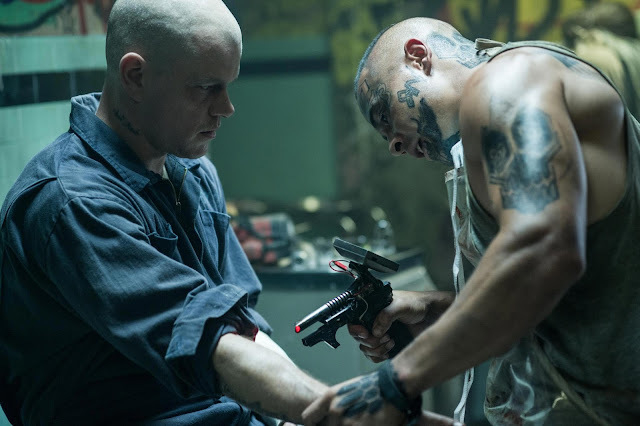 Everyone on Earth dreams of one day making it up out of their squalor and onto Elysium, and consequently, they're having a big of a border problem. Blomkamp, who previously worked with issues of xenophobia, racism, and the dangers of government in District 9 returns to that old hobby horse in Elysium. Here the race and species of the 'other' is not at issue. There are no 'prawns', instead, humanity is divided by a severe rigidity of class. The wealthy are quite able to literally look down upon the rest of humanity, and once that separation occurs, their desire to keep their gated community closed trumps all. These much bigger issues become concentrated in the goals of a single man, Max (Matt Damon), a one-time petty criminal turned diligent factory worker whose world turns belly up when he gets hit with a soon-to-be fatal blast of radiation. Knowing his condition can be reversed on Elysium, he begins to seek illegal transport there, and in selfishly looking out for himself becomes caught up in much more significant events. Blomkamp expands his tenement vision from District 9 into a nightmarish depiction of futuristic Los Angeles. It's impossible not to think, at times, that this is a more plausible version of what The Road Warrior posited decades back: the technology has continued to improve, it trickles down to those who can't afford it via weaponry, broken down goods, and buffers to human contact. The streets are overcrowded instead of deserted, the gangs dress in grimy plainclothes instead of becoming leather punks, tattoos overpower bodies, and dreams are kept in check. Blomkamp makes it easy to see how most citizens of Earth would simply stay in their boxes despite their inarguable rage. The world building is what's great here, and we're able to buy into the idea of this space where uprising is too hard, life conditions too bludgeoning, and the skies are run by border patrol. They're just a bit too distant to be a tangible reality. An interesting touch is the way Earth retains possession of the breadth of human variety. People and cultures have retained the accents of their parents and their culture. The languages, sounds, and -we imagine- customs are in tact. On Elysium, we get the sense that all has become washed out and homogenized. This is evident via the bizarre, vaguely After Earth-like accents on Elysium. 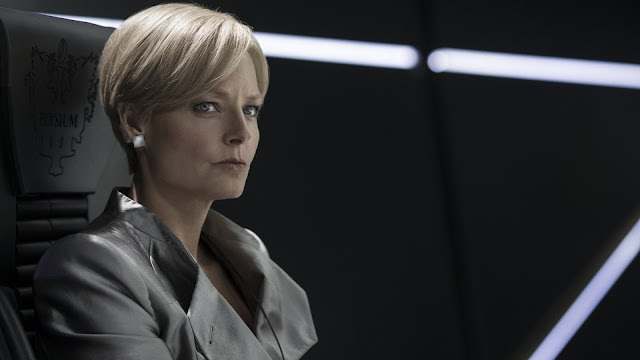 Delacourt (Jodie Foster), a tyrannical and vaguely terrifying bureaucrat, speaks in a mash-up of sounds stemming from the South African accent, but shifting quite often towards different European territories. Perhaps this is a fault of Foster herself, but the weirdness of the speech patterns on Elysium is consistent, suggesting that the wealthy of the world have, in a way, formed their own shared heritage, their own sort of language. This could be an interesting idea, but it's rather distracting, and, frankly...I'm not convinced. When we lose the subtitles of the prawns and switch into a story requiring more typical, exposition-heavy dialogue than District 9, Blomkamp also noticeably loses some of his edge. With the bigger budget, too, comes a less impressive mastery of the material. District 9 was tiny and gritty. It worked, it felt personal. Elysium is giant and lumbering, lording over you with its mashed up ideas and influences. There are very bluntly heavy talking points here, often coming from Delacourt, and they lend an insincerity to the film that doesn't quite mesh with the genuineness its story is invested with. IMMIGRATION. HEALTHCARE. BAAAAAAAHHHHHH. Still, Elysium is a strong film that pulls you towards its characters and gives you reasons to wish for their success. Though technically a work of very practiced dystopian science fiction, the sci-fi elements here are most prominent when you step back, but seem to disappear into the cold facts of the film's environment while you're watching. Even when Max is bolted into a robotic 'suit' and battling in space, Elysium has a weird plausibility that works to its advantage. It's got style, it builds a compelling world, and that will be what saves it. GET HOMELAND SECURITY TO STOP THOSE ILLEGALS. i disliked the fact that the movie's ending made me immediately worry about infrastructure. However, A++++ horrifying evilness from Jodie Foster, and a lovely William Gibson-esque supporting character(Spider) made this pretty enjoyable. I just wish the metaphor hadn't been crammed down our throat as obviously.